The Gran Caribe Real in Cancun has all of the expected wedding ceremony locations from beautiful beach settings to expansive terraces… but as shown in the photo above, they also have a spectacular, glass-walled wedding chapel. 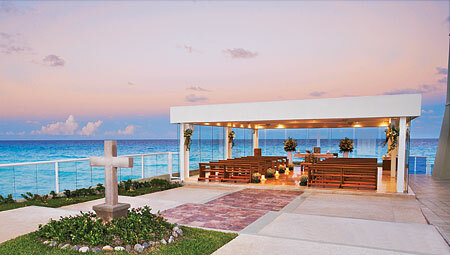 The chapel is used for Civil, Symbolic, and Mayan Ceremonies. One of the best features if that the chapel is also available for Catholic Weddings. If you are Catholic you know how rare it is to find a destination wedding hotel with a Catholic chapel on property. The Wedding Package is FREE if the bride & groom stay in the Master or Presidential Suite or book at least 20 ocean view rooms for their guests for a minimum of 5 nights. Very beautiful!!!! !…What a place Thanks for sharing.